Dr. Smith's ECG Blog: LBBB on Cardiac Ultrasound: do not be fooled into diagnosing a wall motion abnormality! The last case on the blog of LBBB with very high voltage was actually first identified as LBBB by ED bedside echo, which was done PRIOR to the ECG. The images were captured on one of our new ultrasound machines, with Speckle Tracking, which uses software to outline the movement of the myocardium, making it easier to see the wall motion. The sonographers acquiring the image stated "there is a wall motion abnormality." Is there a wall motion abnormality? Better question: the wall motion is abnormal, but why? apical from HQMedEd on Vimeo. White oval: Right Ventricle. Blue Arrow is Septum. Yellow Arrow is LV free wall. Answer: the wall motion is abnormal because of an abnormal sequence of activation: the RV and septum move before the LV free wall. I was looking at this image when the MDs doing the exam claimed there was a wall motion abnormality. I could see that this was due to an abnormal sequence of activation. My response was: "The ECG will show Left Bundle Branch Block." LBBB activates the septum and RV first, through the intact right bundle. Next, the impulse travels through myocardium (not through the high speed purkinje system) to activate the rest of the LV, including the LV free wall. short from HQMedEd on Vimeo. 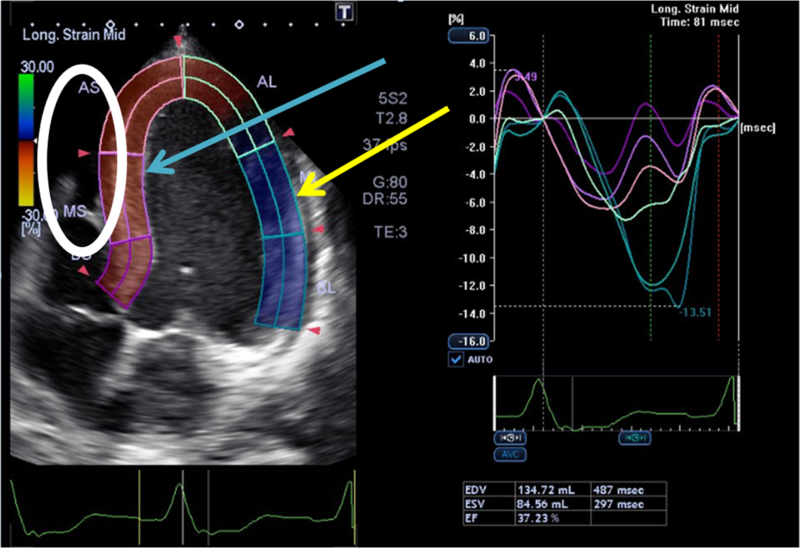 As on the previous video, the septum (left side of outlined LV is activated before the LV free wall. Diagnosing a wall motion abnormality on bedside echo is very difficult and requires a high degree of expertise, and even then is difficult without having contrast material such as Definity (R). False negatives are very common. But there are also false positives: a common false positive is due to bundle branch block. BBB causes an abnormality in the sequence of activation and thus causes wall motion to appear abnormal. However, the wall motion is not abnormal because of decreased motion; it is abnormal only because it is activating in an abnormal sequence compared to the remainder of the heart. You need to have some experience to see this, but once you've learned it you recognise it every time even on a plain 2D echo. It's also helpful to look in a 2 chamber view, there will be less dyssynchrony. Hi Dr. Smith and thank you very much for your interesting threads. I really appreciate this one because it really reflects my every-day experience. But I still have some question to you. You said: "I could see that this was due to an abnormal sequence of activation." - Which elements led you to be that sure of that? - In the echo clip both regional (septum) and global longitudinal strain are reduced, furthermore the EF is 37%. How can you exactly differentiate it from a IHD-related RWMA? 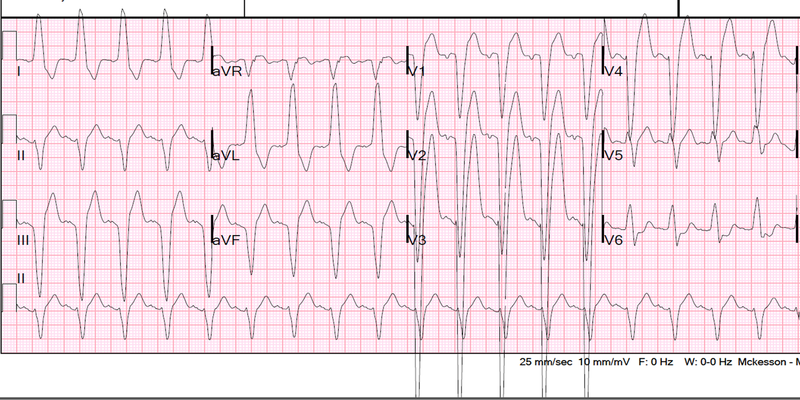 Then also LBBB is a typical sign of IHD, isn`t it? - In my opinion, I do not know an exactly echo measure or feature that allow that distinguish. - Which would be your next diagnostic step to rule out IHD? Stress-echo? KM-Perfusion-Echo (not available im my echo lab)? Nuclear imaging? elderly woman, admitted to the hospital for something else (i.e. diabetes, or infection), not complaining angina nor SOB. Then I found for the first time a LBBB and a similar echo to your case. And now? What´s the next step? Thanks for your very good question. I would not say I personlly could say for certain that there is no wall motion abnormality. I am not an expert in echocardiography, and no contrast was used in the exam. To my inexpert eye, it looks as if all walls are moving, but at the wrong time. So I was able to diagnose LBBB from the echo, and I think all the walls are moving OK, but I could not give a definite interpretation of "no WMA". I do know that echocardiographers who do this all the time and use contrast are able to do so. In this patient, I don't know the etiology of his LBBB, but it may or may not be due to IHD. There are of course many etiologies. I know that our cardiology echocardiographers have confidence in reading EF and WMA in the presence of BBB. Finding a new LBBB by itself does not warrant further workup, except by echo and troponin. If these do not show a clear decrease in EF, or new WMA, then I would not pursue further. If I did find either of these (myocardial infarction by typical troponin rise and fall or new WMA), then I would get a cardiologist involved (I am not a cardiologist).